From our lip kits collection, our LIP INK® Sampler Lip Kit is your most economical kit. It allows you to personally select 2 Guaranteed Smearproof Liquid Lip Colors of your choice. You have the ability to make over one million personalized colors, see color library below for details. LIP INK® Guaranteed Smearproof wax free Semi-Permanent color cosmetics are not compatible with any other cosmetic products or lips kits or superstay lipsticks. Read raves about how LIP INK® products have changed lives forever! View all Sampler Kit colors available and order the kit. Creating over 1 million colors, view our color library to find the perfect color. Follow the step by step instructions for applying and removing color. FREE Lip Color with a purchase of $145 or more! Colors Selected Randomly. Get Free Domestic Shipping on all orders over $150. LIP INK® International is LOHAS. LIP INK® products are: Vegan, Kosher, Natural and Organic. LIP INK® Cosmetics employ a patented 3 product ECO system. 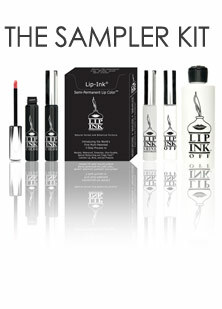 LIP INK® products are: Waxfree with No Glycols or Parabens! New customers should start with our 3 product ECO system Lip Color Sampler Kit. Not compatible with other cosmetic products. LIP INK® International Semi-Permanent award winning botanical liquid Lip Color is tingly fresh with maximum hydration and sun protections, brought back from the future for your healthy lifestyle. LIP INK® Liquid Lip Color is virtually impossible to smear using a multi patented process LIP INK® guaranteed smearproof wax free Semi-Permanent color cosmetics are not compatible with any other cosmetic products because of the technology (covered by nine patents). LIP INK® Lip Color gives you the ability to apply our lip moisturizer to the lips, both hydrating them and protecting them from sun damage before the first application of color. Our products don't create a drying effect like the other long lasting products on the market; and because you don't need a sealer, or lip gloss over the color to keep it Guaranteed Smearproof. LIP INK® Lip Colors have no texture, they feel like you're not wearing any lipstick at all! LIP INK® Liquid Lip Color is made from over 40 herbs, botanicals, vitamins, minerals, antioxidants, natural sun filters, and FDA approved pigments, all in a natural corn grain Ethanol preservative free base. LIP INK® Liquid Lip Color is virtually impossible to smear using a multi patented process of three water and oil insoluble candy pill coatings that have zero texture (with Proper Application Process). LIP INK® - Not Ink, Just the staying power of Ink! SMEARPROOF AND LONG LASTING - Guaranteed smearproof & Long Lasting award winning ECO-friendly, green chemistry, botanical color cosmetics, from patented technology. Yes, you should feel a tingle upon first application, this lets you know that the product is working! Our 3 product ECO system, consists of Water, Oil and Botanical blended liquid smearproof color. You need all three, to use our products properly. They are sold to first time users, in complementary kits that allow you to choose your own colors. Yes, our lip color can change on a plane, but you can change it back. Yes, our products are 100% different than long lasting lip color. Yes, we hold the worlds record! We can make over a million colors for your lips. Yes, we have no need to apply a sealer or lip gloss over the top of our lip colors, to keep them from smearing! Yes, our lip colors are guaranteed smearproof, with no wax, parabens, lead, petroleum products, butters, cholesterols, animal products or glycols. Yes, we can cover a scar, tattoo, or bruise, with our patented encapsulation process. Yes, we can create fuller lips by applying our lip color deep into the wet area where other lip color can not be applied revealing more of the natural lips, than any other lip color. No more dry lips. We apply our lip moisturizer under and before the, lip color is applied, giving you maximum hydration and sun protection. You can re-apply our moisturizers through out the day for added protection, without disturbing your smearproof color finish. The botanicals in our lip color formulations, cause a natural exfoliation, to occur leaving you with softer, smoother, fuller, healthier, younger looking lips. Yes, we support sustainability. We have two recycling programs. One to support our customers and retailers and the other to support artists that paint with our products, we have a museum on our web site to show the ECO paintings. Our products are Vegan, Kosher, Natural, Organic Herbs and Botanical Blends with Maximum Hydration and Sun Protection. We support lifestyle over trends & fads. We choose Empowerment over Glamour. THIS IS HOW WE APPLY LIP INK® COLOR. ASESIOD (A Smooth Even Stroke In One Direction). This insures that your color goes on even. We brought LIP INK® guaranteed smearproof herbal liquid color cosmetics, back from the future, for an ECO friendly world! Our award winning products have been granted 9 patents with over 15 years of smiling women's faces supporting them. Our botanical color blends are liquid, like water "THEY CAN SPILL". With each use, be sure to shake the vial against the palm of your hand until you hear the beads move freely to assure the pigments are blended. Our Guaranteed smearproof Lip color DOES NOT REQUIRE the use of a sealer or lip gloss to be applied over it, at any time. LIP INK® liquid lip color, has zero texture. If you are experiencing any grittiness, this is your own lips exfoliating. We recommend that you take the color off and re-apply, following the patented LIP INK® directions. My color is not staying on and that's because you may have applied too much all at once. Less is better when applying LIP INK® Liquid Lip Color. Always remember to HYDRATE YOUR LIPS before color application, by applying any one of our 100 wax free lip moisturizers first, BEFORE YOUR APPLICATION OF LIP INK® Botanical sheer GUARANTEED smearproof liquid lip color. SMEARPROOF AND LONG LASTING The award winning, multi-patented guaranteed smearproof lip color and cosmetics are eco-friendly, and made from natural botanical ingredients without the use of animal waxes or artificial preservatives. The Patented 3 product ecosystem consists of three product types: Water, Oil and Botanicals (OFF, Shine, and Color). Using all three products is the only way to achieve truly guaranteed smearproof results. LIP INK color cosmetics are sold to first time users in kits with over 60 colors to choose from. LIP INK® cosmetic color require a remover because the color cannot be removed with soap and water. The remover LIP INK® OFF is also the base conditioner to the color application and is so gentle it can be used to around the eye area to remove products like the LIP INK® Eyeliner. No color cosmetic can claim to be Patented Guaranteed Smearproof if it does not require a remover to remove it. The LIP INK® OFF solution which acts as a base conditioner and color remover actually causes a natural exfoliation to occur leaving you with softer, smoother, fuller, healthier, and younger looking lips! No more dry lips! Apply the LIP INK® Shine Moisturizer underneath and before the lip color is applied for maximum hydration and sun protection. You can re-apply any of the LIP INK® Moisturizers throughout the day for added protection - without disturbing your smearproof color finish. No other long lasting lip color can be applied this way. The colors have no texture and feel like you are not wearing any lipstick at all! LIP INK® Liquid Lip Color is made from over 40 herbs, botanicals, vitamins, minerals, antioxidants, natural sun filters, and FDA approved pigments. Natural corn grain Ethanol creates a preservative-free base. LIP INK® Liquid Lip Color is virtually impossible to smear using the 3 product process of OFF, Shine and Color (with proper application). Quick Tip - Create fuller lips by applying the lip color deep into the wet area where other lip colors cannot be applied, revealing more of your natural lips than any other lip color. LIP INK® International holds the world record! Create more than a million lip colors and shades with the patented technology through layering. The botanical color blends are liquid like water so take care because THEY CAN SPILL. With each use, be sure to shake the vial against the palm of your hand until you hear the beads move freely to assure the pigments are fully blended. Since the LIP INK® Color is liquid, you can blot the tip of the applicator with a tissue before applying your color. That puts you in the driver's seat when it comes to the shade of color you want. Using this one technique you can take Red all the way down to Pink, giving you 500 color variations with just one color, and can layer one color over another - up to three layers giving you another 1000 shades of color. LIP INK® Color Cosmetics are made from Vegan, Kosher, Natural, Organic & Botanical ingredients not tested on animals and are not compatible with any other cosmetics. The results you achieve using the LIP INK Guaranteed Smearproof Color will far out way leaving your old fashioned lip color behind!